Extraction is key to the production process. To extract the kernels, workers first dry argan fruit in the open air and then remove the fleshy pulp. Some producers remove the flesh mechanically without drying the fruit. Moroccans usually use the flesh as animal feed. "In cosmetics, Argan oil is advocated as moisturizing oil, against acne vulgaris and flaking of the skin, as well as for 'nourishing' the hair. This oil has also [sic] medicinal uses against rheumatism and the healing of burns. Externally, Argan oil is used for hair as brilliantine, to fortify and in the treatment of wrinkled or scaly dry skin." Argan oil has become increasingly popular for cosmetic use. The number of personal-care products on the US market with Argan oil as an ingredient increased from just two in 2007 to over 100 by 2011. It is sometimes mixed with pomegranate seed oil due to its antioxidizing benefits, with vendors promoting this blend as an all-in-one serum both for skin and hair. Argan oil is also sold without additives as a natural skincare and hair care product. The production of argan oil has always had a socioeconomic function. At present, argan oil production supports about 2.2 million people in the main argan oil-producing region, the Arganeraie. Much of the argan oil produced today is made by a number of women's co-operatives. Co-sponsored by the Social Development Agency with the support of the European Union, the Union des Cooperatives des Femmes de l’Arganeraie is the largest union of argan oil co-operatives in Morocco. It comprises 22 co-operatives that are found in other parts of the region (e.g., Coopérative Al Amal, Coopérative Amalou N'Touyag, Coopérative Tissaliwine, Coopérative ArganSense, and Coopérative Maouriga). 1 2 Khallouki, F; Younos, C; Soulimani, R; Oster, T; Charrouf, Z; Spiegelhalder, B; Bartsch, H; Owen, RW (2003). "Consumption of argan oil (Morocco) with its unique profile of fatty acids, tocopherols, squalene, sterols and phenolic compounds should confer valuable cancer chemopreventive effects". European Journal of Cancer Prevention. 12 (1): 67–75. doi:10.1097/01.cej.0000051106.40692.d3 (inactive 2016-02-01). PMID 12548113. ↑ "Arganolie informative (NL)". Archived from the original on November 5, 2016. Retrieved November 5, 2016. 1 2 3 Charrouf, Zoubida; Guillaume, Dominique (2008). "Argan oil: Occurrence, composition and impact on human health". European Journal of Lipid Science and Technology. 110 (7): 632. doi:10.1002/ejlt.200700220. 1 2 Charrouf, Zoubida; Guillaume, Dominique (1999). "Ethnoeconomical, ethnomedical, and phytochemical study of Argania spinosa (L.) Skeels". Journal of Ethnopharmacology. 67 (1): 7–14. doi:10.1016/S0378-8741(98)00228-1. PMID 10616955. ↑ Monfalouti, HE; Guillaume, D; Denhez, C; Charrouf, Z (Dec 2010). "Therapeutic potential of argan oil: a review". J Pharm Pharmacol. 62 (12): 1669–75. doi:10.1111/j.2042-7158.2010.01190.x. PMID 21054392. ↑ Charrouf, Z; Guillaume, D (2007). "Phenols and Polyphenols from Argania spinosa". American Journal of Food Technology. 2 (7): 679. doi:10.3923/ajft.2007.679.683. ↑ Chimi, H; Cillard, J; Cillard, P (1994). "Autoxydation de l'huile d'argan Argania spinosa L. du Maroc" [Autoxidation of argan oil Argania spinoza L. from Morocco]. Sciences des aliments (in French). 14 (1): 117–24. ISSN 0240-8813. ↑ Charrouf, Zoubida; Guillaume, Dominique (2010). "Should the Amazigh Diet (Regular and Moderate Argan-Oil Consumption) have a Beneficial Impact on Human Health?". Critical Reviews in Food Science and Nutrition. 50 (5): 473–7. doi:10.1080/10408390802544520. PMID 20373191. ↑ El Babili, Fatiha; Bouajila, Jalloul; Fouraste, Isabelle; Valentin, Alexis; Mauret, Severine; Moulis, Claude (2010). "Chemical study, antimalarial and antioxidant activities, and cytotoxicity to human breast cancer cells (MCF7) of Argania spinosa". Phytomedicine. 17 (2): 157–60. doi:10.1016/j.phymed.2009.05.014. PMID 19576744. ↑ Elfalleh, Walid; Tlili, Nizar; Nasri, Nizar; Yahia, Yassine; Hannachi, Hédia; Chaira, Nizar; Ying, Ma; Ferchichi, Ali (2011). "Antioxidant Capacities of Phenolic Compounds and Tocopherols from Tunisian Pomegranate (Punica granatum) Fruits". Journal of Food Science. 76 (5): C707–13. doi:10.1111/j.1750-3841.2011.02179.x. PMID 22417416. ↑ Schubert, Shay Yehoshua; Lansky, Ephraim Philip; Neeman, Ishak (1999). "Antioxidant and eicosanoid enzyme inhibition properties of pomegranate seed oil and fermented juice flavonoids". Journal of Ethnopharmacology. 66 (1): 11–7. doi:10.1016/S0378-8741(98)00222-0. PMID 10432202. 1 2 L. Siegle (February 12, 2012). "The trees of life. Should hairdressers be promoting argan oil?". The Observer. ↑ Y. Moussouris & A. Pierce. "Biodiversity links to cultural identity in southwest Morocco: The situation, the problems and proposed solutions". Arid Lands Newsletter No. 48, November/December 2000. ↑ "Lancement d'une opération de reboisement de 13 hectares d'arganier à Essaouira". ↑ "Réseau des Associations de la Réserve de Biosphère Arganeraie RARBA". ↑ "Projet 1: Programme National de Lutte contre la desertification (PAN/LCD) en partenariat avec la coopération technique Allemande (GTZ)" (PDF). 1 2 R. Dochao. "The European Commission Supports Mediterranean Women: Three Tales about Making a Difference" (PDF). 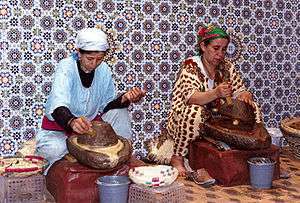 ↑ "Argan oil helps Moroccan women become breadwinners". BBC News. ↑ "La Fondation Mohamed VI pour la recherche et la sauvegarde de l'arganier tient sa première assemblée générale à Essaouira". ↑ Z. Charrouf and S. Dubé. "Helping Moroccan Women Preserve the Argan Tree at the Gateway to the Sahara".